Entry by Eli-san on Tue Mar 6 15:17:01 2012. 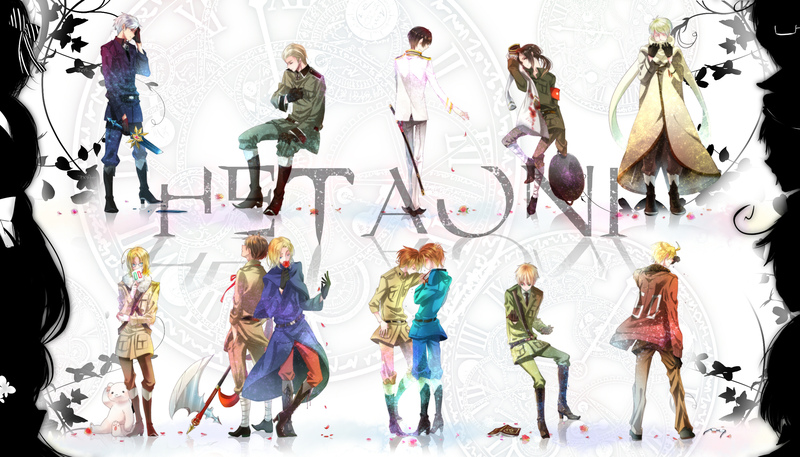 I especially like Canada, China, Italy brothers, and Prussia. The arts beautiful though. Really, really, beautiful. Truly a masterpiece, HetaOni is. o(╥﹏╥)o Saddening, but heartful. Shadows left: Liechtenstein (Lili), Ukraine (Kat), Belarus (Natalya) and Hungary (Elizaveta). Prussia (Gilbert), Germany (Ludwig), Japan (Kiku), China (Wang Yao), Russia (Ivan), Canada (Matthew), Spain (Antonio), France (Francis), S.Italy/Romano (Lovino), N.Italy/Veneziano (Feliciano), England (Arthur) and America (Alfred). Oh **** this i am not letting you guys die again damn it! That traumatized me enough! *grabs Spain, Italy, Romano, Prussia, Iggy, America, and America* The rest of you hold off Steve!! @MiharuAruhi: I heard from somewhere heels were originally made for men. Not sure those. I love this picture. I love how China has Japan's jacket. Canada and Spain are just rocking this. Anyway - the whole picture is just impressive. I have no words, it's beyond godlike! Without a doubt I can say that HetaOni is one of the best things that have ever happened to me. P.S. : I really love the high heels. I actually prefer them with high heel O.O Idk, they look amazing with them.